Based on an increased budget for the TEN-T in the years 2014-2020 totalling to EUR 26,3 billion, a new transport network will be developed with nine corridors forming the “Core Network” laying the foundation for a truly European transport network across 28 Member States. After the framework for the new Trans-European Transport Network (TEN-T) came into force on 1st January, 2014, the European Commission signed contracts with several external consultants to provide analyses and technical assistance to draft work plans for the TEN-T Core Network Corridors. The North Sea – Baltic Corridor (red), excerpt from the official Core Netowork Corridor map of the European Commission. 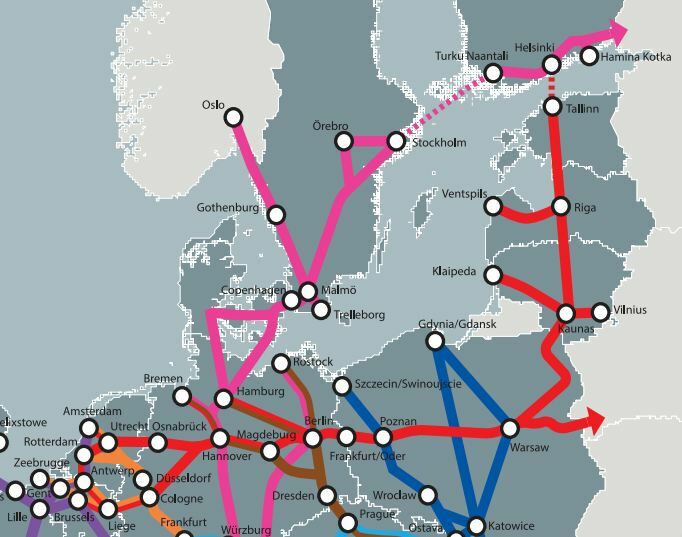 The 3200 km long North-Sea Baltic Corridor connects the Baltic ports of Helsinki/Tallinn with the North Sea ports of Bremerhaven, Amsterdam, Rotterdam and Antwerp as well as the inland port of Brussels. It starts at the modem harbours on the Gulf of Finland of Helsinki (Vuosaari) and Tallinn (Muuga) passing south through the three Baltic States and North Eastern Poland to Warsaw. From there it follows the East-West corridor to Lodz, Poznan and Berlin continuing to the ports on the North Sea coast and Brussels. The North-Sea-Baltic Corridor crosses eight Member States and will have branches: to Ventspils in Latvia and another to Klaipeda and Vilnius in Lithuania. The Corridor will for the first time provide modern transport links between Finland, the three Baltic States and Poland, Gemany and the countries of the Single Market to the West. Advisor James Pond (DG MOVE), Gerard Bruil, Malla Paajanen, Tõnis Tamme, Martin Heiland, Jürgen Werner. Proximare has been commissioned by the Directorate-General for Mobility and Transport of the European Commission (DG-MOVE) with carrying out a study on the North Sea-Baltic Core Network Corridor. The contract was signed as a result of open procurement procedures and the Consortium will carry out the analysis during the year 2014 by supplying detailed description of North-Sea Baltic Corridor, identifying the relevant stakeholders and assisting DG-MOVE in establishing a Corridor Forum. The outputs of the work will be submitted by the European Coordinators to the Member States for approval by the end of this year.